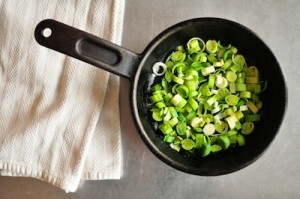 This is one of my favorite go-to quick and healthy dinner solutions. It takes less than 15 minutes from start to finish and I make it almost once a week, when I’m short on time and feel like something homey and healthy. 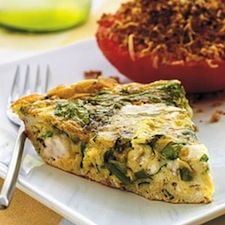 Frittatas are like a crust-less quiche, which makes them lower in calories and saturated fat while being quicker to cook. *Look for specialty eggs that are fortified with omega 3s and vitamin D.
In a medium bowl, whisk eggs and add in milk, half of the cheese and salt and pepper. 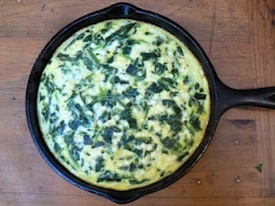 In a 12-inch oven-proof nonstick pan heat olive oil and add garlic and cook for 1-2 minutes. Add spinach, mushrooms, leek and cook until vegetables are tender; about 5 minutes. Season with additional salt and pepper, if desired.